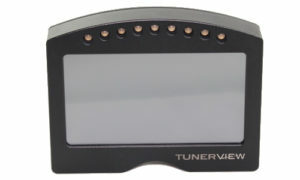 We are gearing up to release the TunerView RD 2, which we think is going to make a big impact on the market. This unit is our first offering in the color display arena and we think you’ll like it! We strive to offer quality display peripherals and make them as affordable as possible. After seeing multiple color display options get released at prices that are out of reach for most of the mid-level racers and weekend enthusiasts we had to come up with a quality affordable solution. Having an existing background creating simple and affordable display peripherals this was logically the next step in our evolution, so it was the right time to make it happen. It did not take much in the way of hardware to get this project up and running. Even the case design was simple. We opted for a side exit wiring strategy to eliminate some of the larger costs. To put it simply a Mil Spec connector and pre-built custom wiring harness would have cost as much as all of the electronics used internally… and the case. Yes, as much as the entire unit costs to produce. That would have easily put this over $1000 retail and that simply was not the goal. If you’re really yearning for that Mil Spec connector we may release a version down the road that has one.